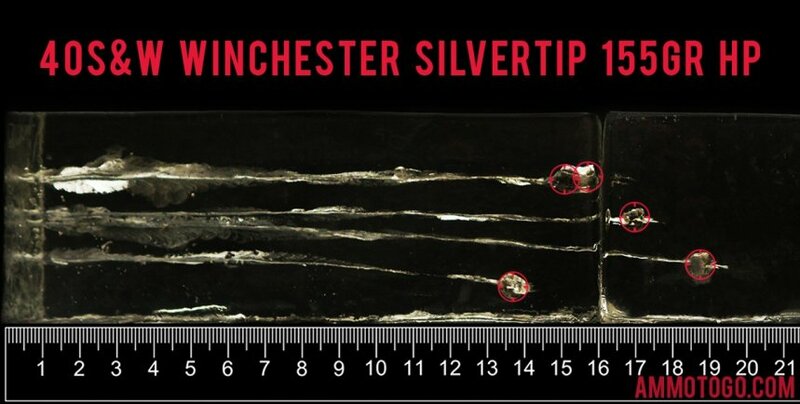 This is 40 S&W Winchester Silvertip 155gr. Hollow Point Ammo. 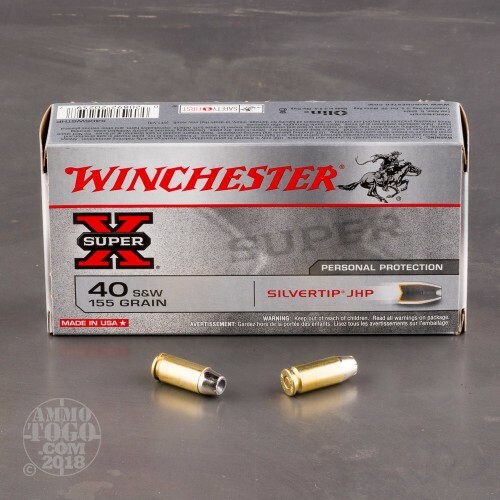 Winchester Super-X Silvertip Ammo offers a unique combination of power, precision, reliable functioning and on-target performance, via a specially engineered jacketed bullet. This bullet delivers penetration and rapid energy release with virtually no weight loss or bullet fragmentation. 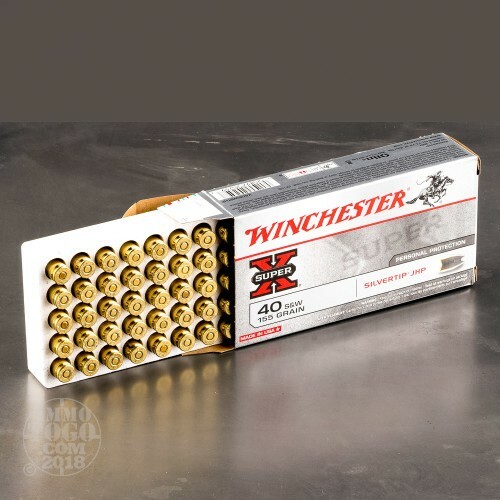 This is the recommended ammo of many handgun manufacturers, due to its reliable functioning. It is a tried and true hollow point for self defense. This ammo is brass cased, boxer primed, non-magnetic and non-corrosive. It comes packed in 50rd. boxes. Muzzle Velocity: 1205 fps. 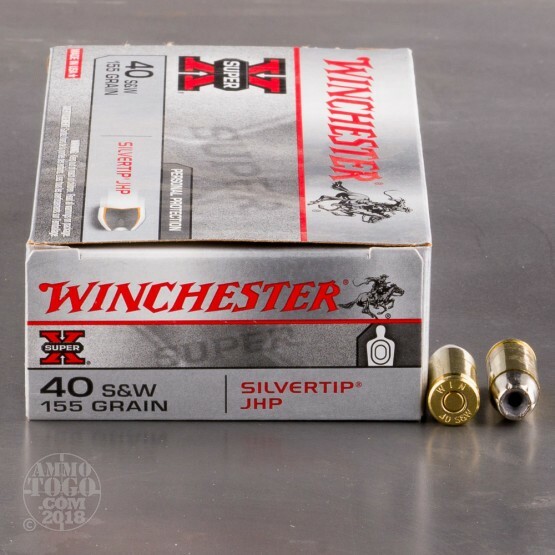 How do the results for this Winchester Ammunition 40 Smith & Wesson compare to other 40 S&W? 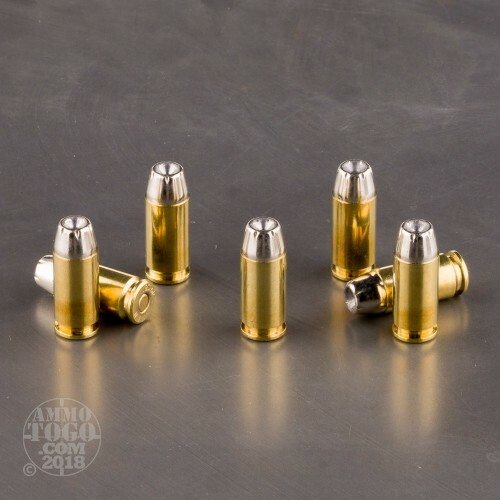 Expansion Diameter Compared to All 40 Smith & Wesson Ammo Tested MIN 0.39" MEDIAN 0.65" THIS AMMO 0.63" U.S. dime MAX 0.89"
Penetration Depth Compared to 40 Smith & Wesson Tested 0" 10" 20" 30" MIN 9.8" MEDIAN 16.5" THIS AMMO 16.2" MAX 32"
This is good ammo, but the description is wrong, this round tends to not have great weight retention due to the high velocity light weight of the round and not being bonded. However this round has 500 fps out the muzzle and 1220 fps velocity. It hits hard and travels fast but doesn't retain weight so its all about what u want, it is very accurate too. This is the only 155gr. ammo I've tested that showed consistent expansion & penetration. It should give 12" of bodily penetration, and since the jacket doesn't separate from the bullet, it retains its weight. This is the only lighter ammo I'd feel confident with in 40 S&W.